The Battle of Hanover kept J.E.B. Stuart and his cavalry from arriving in Gettysburg until the second day of the battle. through the mountains. Between June 17 and June 19, the Union and Confederate cavalry forces engaged each other at the Battle of Aldie, the Battle of Upperville, and the Battle of Middleburg. Although the Federal cavalry performed well, forcing the Rebels to give ground, Stuart successfully blocked the mountain passes, frustrating Pleasonton’s efforts to ascertain Lee’s intentions. The next week, Lee approved Stuart’s plan to leave two brigades guarding the passes through the Blue Ridge Mountains, and to ride east with his remaining three brigades. Stuart intended to maneuver himself around the rear of the Union army and then ride north to join Ewell’s Corps in Southern Pennsylvania. Stuart’s objectives were to gather intelligence about the Army of the Potomac’s movements, and commandeer supplies if possible. Departing on June 25, Stuart skirted south of Major General Winfield S. Hancock’s Federal 2nd Corps. On June 28, his troopers plundered a Federal supply depot at Rockville, Maryland, capturing a train of 150 wagons. Sensing no urgency to return to the main army, Stuart’s progress was slowed by his decision to take his bounty with him, rather than destroy it. On June 29, the Rebel cavalry stopped at Union Mills, Maryland, as it traveled north toward Pennsylvania. 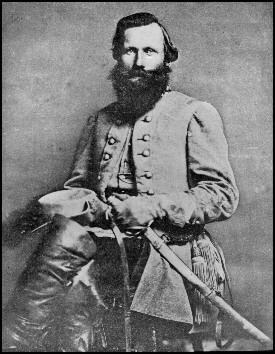 Brigadier General H. Judson Kilpatrick’s 3rd Cavalry Division of the Army of the Potomac was just six miles northwest of there at Littlestown, Pennsylvania. Eager to join Ewell’s infantry, Stuart chose to avoid an engagement with Kilpatrick. Instead, on the next day, he headed toward Hanover, Pennsylvania, roughly ten miles to his north. Unbeknownst to Stuart, Kilpatrick was also moving toward Hanover on June 30. Having a shorter distance to cover, Kilpatrick’s forces arrived at Hanover first. The Union cavalry had nearly passed through the village by about 10 a.m. when the Rebels surprised their rear guard, sending them scurrying into town. Upon hearing the sounds of gunfire, Kilpatrick’s column reversed course and mounted a spirited counterattack, driving the Grey Coats back out of the village. The ensuing action quickly developed into a full-scale cavalry engagement in and around Hanover. At one point, Stuart barely escaped being captured by pursuing Yankees by leaping his horse over a fifteen-foot-wide ravine. Skirmishing continued in and around the town as both commanders positioned their big guns, setting the stage for a two-hour artillery duel during the afternoon. As the day progressed, Stuart became convinced that Kilpatrick had gained the advantage and chose to withdraw in the direction of York, Pennsylvania with his captured wagon train, still planning to find Ewell. Although casualties were light on both sides (roughly 330 killed and wounded), the Battle of Hanover was a significant engagement because it delayed the arrival of Stuart’s cavalry at the Battle of Gettysburg until mid-afternoon of the second day of that pivotal conflict. Stuart’s late arrival deprived Lee of vital information about Union troop deployments prior to the battle, and his absence also limited the effectiveness of the Army of Northern Virginia during the first two days of the engagement. Ohioan George Armstrong Custer, who had been promoted all the way from captain to brigadier general just two days before the Battle of Hanover, distinguished himself by anchoring the Union right flank with his Michigan Brigade during the conflict.